In Germany, it is a political objective to advance the grid expansion by installing underground cables. The Federal Government – and also the four German transmission system operators (TSOs) – hope by this means to increase public acceptance of the high-performance power lines needed to transmit electricity from the windy north of the country to the consumption-intensive south and west. But what the resident population may welcome, unsettles those through whose land the underground routes run, especially owners and cultivators of agricultural land. 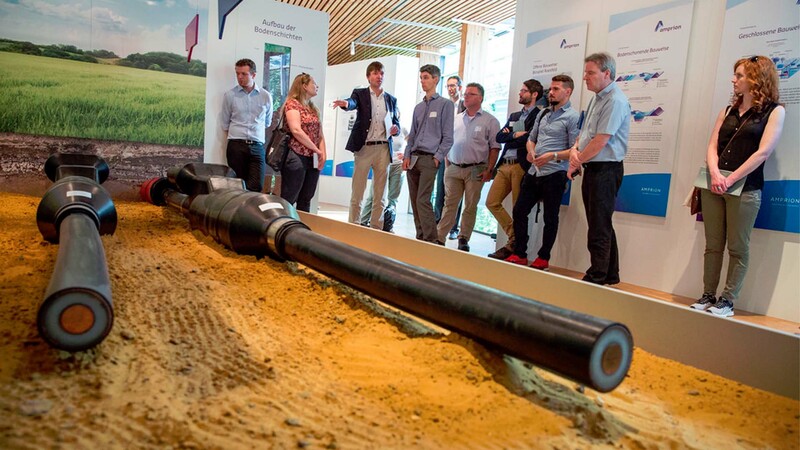 The Dutch-German TSCNET shareholder TenneT itself would like to learn more about possible impacts of underground cabling on agriculture, for example in terms of soil physics or groundwater quality. The TSO has thus entered into a research cooperation with the Georg-August-University Göttingen. 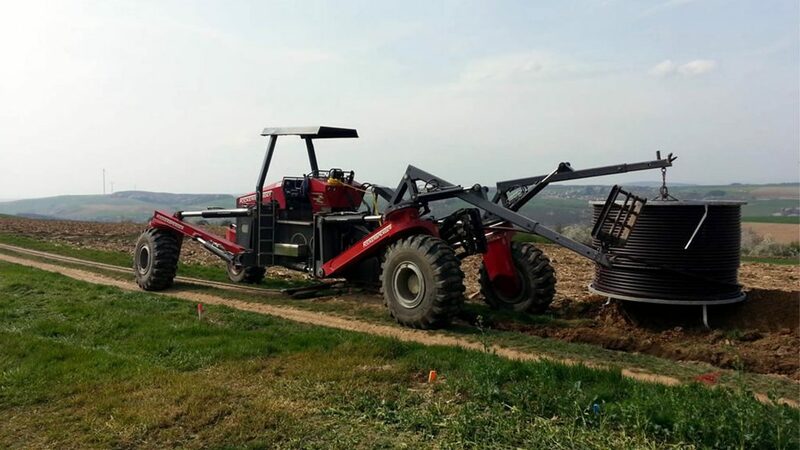 Together with members of the Departments of Agricultural Soil Science as well as Agricultural Economics and Rural Development, subsection Agribusiness Management, the long-term effects of three-phase underground cables on agricultural land will be investigated over a period of six years. 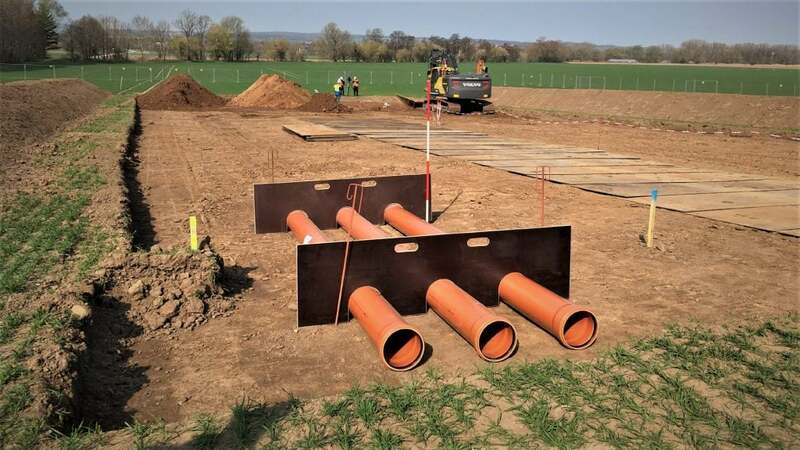 For this purpose, a 2500m² test field for the construction and operation of 380kV underground cables is being set up at the Reinshof test farm near Göttingen in the German state of Lower Saxony. The research partners hope to draw concrete conclusions from the test results for the construction of extra-high voltage underground cable routes as well as recommendations for recultivation measures. For these purposes, the operation of underground cables is simulated on the test field. Empty conduits are heated through heating tapes so that their thermal characteristics correspond to the power loss of real 380kV three-phase underground cables. In addition, the effects of the construction works are investigated. In this context, it is also of interest how long it takes until the original soil condition is restored. The power line from Wilhelmshaven on the German North Sea coast to the Conneforde substation in Ammerland, both in the federal state of Lower Saxony, is one of those line projects in Germany that are urgently needed to extend the transmission capacities for wind energy from northern Germany to the consumption centres in the south and west. Moreover, the 380kV line is one of the German pilot projects for partial underground cabling in the three-phase current range. It will be around 30km long and comprise 60 pylons. In two sections, underground cables will be laid over a length of around 5.3km. 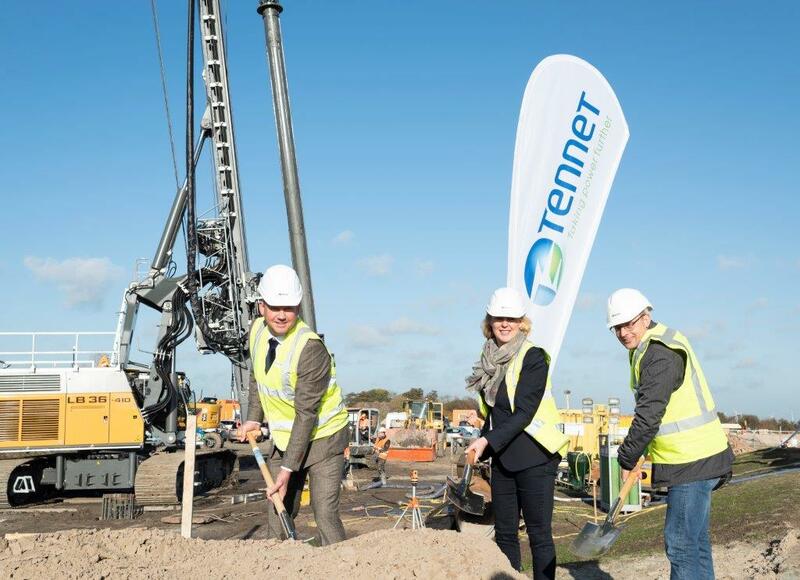 TSCNET shareholder TenneT has now begun construction of the new line with a symbolic turning of the first sod in Conneforde. The Dutch-German transmission system operator (TSO) by no means celebrated its first new construction in recent times: “This is already the fifth grid expansion project in Lower Saxony for which we can officially start construction within one year,” explains Lex Hartman, Managing Director of TenneT. Also the Fedderwarden substation (near Wilhelmshaven) is yet to be built. The scheduled commissioning date for line and substation is 2020. To create transparency in the design process, TenneT involved the interested public, citizens as well as public stakeholders, much more in the planning than the formal procedure would have prescribed. In three years, the TSO has organised nine information markets along the route and conducted numerous individual discussions. “It is our central concern to harmonise our projects as closely as possible with the country and its people, while realising a secure energy supply for the benefit of electricity consumers,” explains Mr Hartman. As a responsible and future-conscious transmission system operator (TSO), TSCNET shareholder Amprion is committed to the European Energy Union. 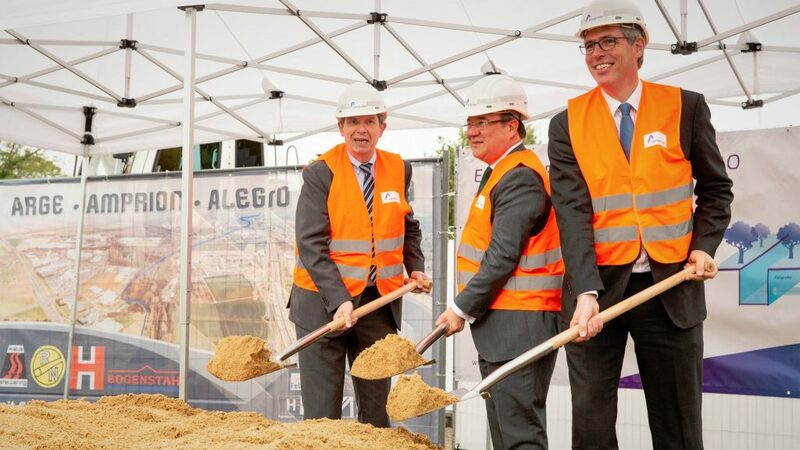 An outstanding project in this respect is the Aachen Liège Electricity Grid Overlay (ALEGrO), the first interconnector to directly connect the German and Belgian electricity grids. The European Project of Common Interest (PCI) is being implemented jointly by Amprion and the Belgian TSO Elia. Following a pleasingly short approval procedure, the starting signal for ALEGrO was given today in the commercial area of the west German city of Aachen. Here, Amprion celebrated the start of construction with a symbolic turning of the first sod. For the entire ALEGrO route (about 49km in Belgium and 41km in Germany) underground cabling will be used. The cable laying work is accompanied by the installation of converters at the ends of the cable in Oberzier in Germany and Lixhe in Belgium, which convert AC into DC and vice versa. ALEGrO will have a transmission capacity of 1,000MW and thus provide urgently needed grid capacities for cross-border electricity flows. At the same time, ALEGrO will also strengthen supply security in the Aachen-Cologne region. It was only two days ago that the Swiss electricity transmission system operator (TSO), TSCNET shareholder Swissgrid, announced the start of construction work on the new 380kV line in Canton Valais. Now the company has signalled the kick-off for building the 1.3km long line section at “Gäbihübel” near Bözberg/Riniken in the canton of Aargau, where the extra-high voltage cable for a 380kV line will be laid underground for the first time. The section is part of a line whose voltage will be increased from 220 to 380kV. The upgrade will increase the security of supply, particularly in the metropolitan areas of Zurich and Central Switzerland. The technically challenging project is also regarded as an important step in the implementation of the so-called Strategic Grid 2025. The modernisation of the transmission grid is a key factor for a sustainable energy policy, which the country intends to implement with its Energy Strategy 2050. Each line project is developed in a multi-stage planning and approval procedure which involves federal offices, cantonal authorities, environmental associations, network operators and other stakeholders. 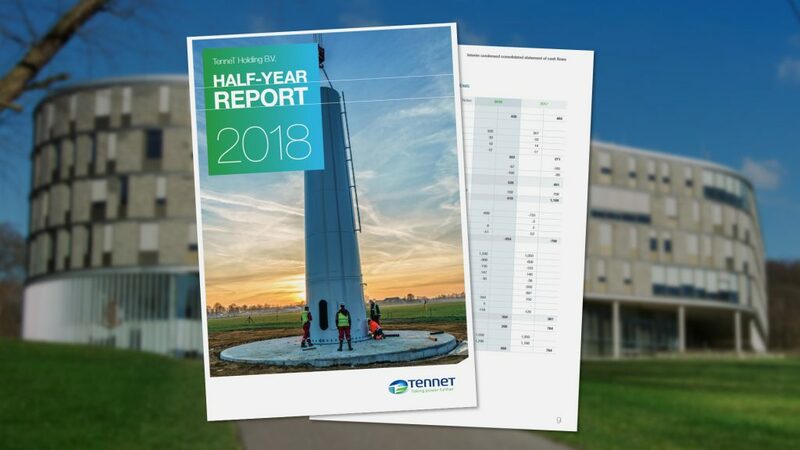 The Half Year Report of the Dutch-German TSCNET shareholder TenneT does not only provide satisfactory figures, but also shows that the business of a transmission system operator (TSO) with a control area from the seashores to the Alps is essentially divided into two parts: connecting offshore wind energy capacity to the onshore grid and ensuring the transport of sustainable generated electricity to wherever it is needed. To further support the energy transition, TenneT is accelerating the realisation of large-scale projects in the Dutch sector of the North Sea and on the German mainland. The TSO’s commitment to the European energy future is reflected with a total of €904m of investments in the transmission systems in the first half of 2018 ‒ not only impressive compared to the first half of 2017 (€750m). By 2030, TenneT plans to have connected a total of 11.5GW of offshore wind energy to the grid in the Netherlands. Three years earlier, in 2027, the TSO aims to achieve a total transmission capacity of 11GW for the German North Sea. 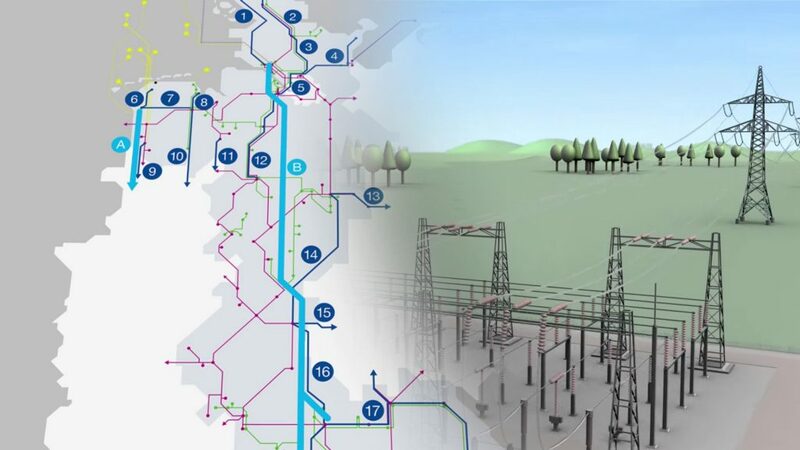 The most outstanding onshore infrastructural projects are the German supraregional extra-high voltage lines SuedLink and SuedOstLink with a length of 700km and 580km, respectively, and a combined capacity of 6GW. Both DC lines will partially be realised by means of underground cabling and are joint ventures of TSCNET shareholders. On SuedLink, TenneT cooperates with TransnetBW, and on SuedOstLink with 50Hertz. To help financing its investments in the transmission of the renewables, TenneT in March 2018 again has issued long term green bonds in two tranches with a nominal total value of €1.25bn. Altogether, TenneT has issued €6.25bn in green bonds to date. The total length of the German transmission system is currently about 35,000km. In the course of the energy transition, the four German transmission system operators (TSOs) are faced with the demanding task of expanding the grid by around 5,300km, so that electricity from renewable sources reliably reaches the consumption centres in the south and west of the country. Especially near cities and villages, the TSOs are required to employ underground cables instead of overhead lines to increase public acceptance of the grid extension. The Dutch-German TSCNET shareholder TenneT is convinced that in the officially specified pilot sections superconducting cable systems should be used, as they offer significant advantages over traditional cable systems. This is the result of a feasibility study conducted by the renowned Karlsruhe Institute of Technology (KIT) in close cooperation with TenneT in the framework of the government-funded “Kopernikus”-project “Ensure”. With this research project, TenneT once again shows its great interest in the further development of underground cable technologies. The main challenge of the project is that superconducting technology has never been used at the extra-high voltage level. The cable test system is designed for a continuous output of 2300MW and, at high current load, has significantly lower losses than conventional cables with a copper conductor. Superconductor technology could also be beneficial for the width of the cable trench, since a superconducting cable system only requires six cables, while a conventional one comprises twelve three-phase cables, explains Hanno Stagge, project manager at TenneT. The newly designed superconducting cables for the transmission network are based on high-temperature superconductors made of ceramic. They need less cooling and can therefore be operated relatively cost-effectively. The study should be completed by the end of the year and will also include ecological and economic considerations. However, there is still a long way to go before the superconductor is ready for use: “Subsequent to the study, the cable in combination with the necessary connecting sleeves and closures have to be manufactured and then intensively tested together with a cooling system”, comments Mr Stagge. TSCNET shareholder TenneT conducts a feasibility study on underground superconducting cables together with KIT (collage of images by ITEP/KIT and TenneT). An availability rate of electricity of 99.995% of the time in 2017 is quite impressive, and the Danish TSCNET shareholder Energinet is the transmission system operator (TSO) presenting this outstanding value in its “Security of electricity supply report 2018”. With this remarkable confirmation of last year’s result (99.996%), Denmark is again among the leading European countries. According to Energinet, the excellent security value is partly due to the high level of underground cabling in Denmark. The key features of today’s energy landscape ‒ such as the integration of extensive and increasing wind and solar power capacities, more electricity interconnectors between different countries, or the harmonisation of markets and grid operation via EC regulations ‒ all affect the Danish supply security, which is no longer a national, but a regional issue. Energinet is aware of the new challenges and will adress these with operational and infrastructural measures, but also with the introduction of market reforms to increase the flexibility of both, generation and consumption. 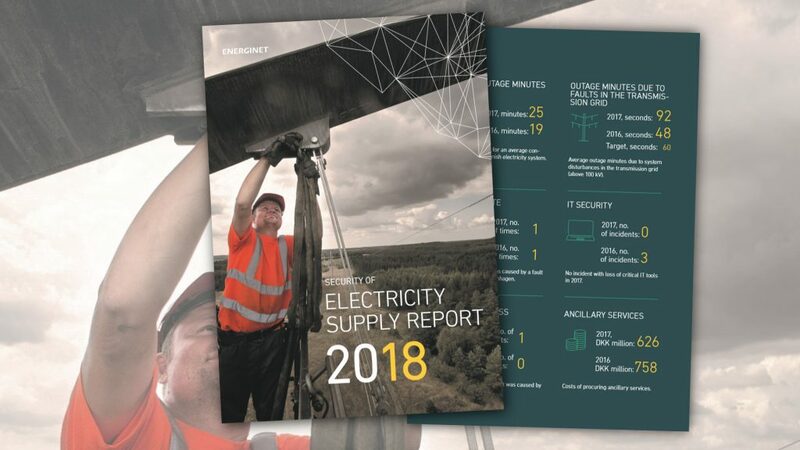 TSCNET shareholder Energinet, the Danish TSO, presents impressive figures in its Security of electricity supply report 2018. The public today is ‒ understandably enough ‒ sensitive to interferences with nature and landscape. At the same time, the energy transition is desired by a large majority of the Germans but can only succeed if grid extension keeps pace with the expansion of regenerative energy production. Of course, this applies to the whole of Europe, but especially to Germany, where most of the considerable green energy production sites are far away from the densely populated and industrialised consumption centres. As underground cables reduce the inevitable impact on nature and make it less visible, they are well-suited to attract the public to the need of extending the transmission system. A significant infrastructure project is the new 380kV line between the substation Dörpen/West in the Emsland district and the Lower Rhine Region, since Dörpen/West is the onshore converter station for large amounts of offshore energy. Two TSCNET shareholders are responsible for the line. The Dutch-German transmission system operator (TSO) TenneT realises the section between Dörpen and Meppen, from where the line is continued by the German TSO Amprion. For the most part, overhead lines will be deployed, but on a section near the town of Haren, underground cables will be used. 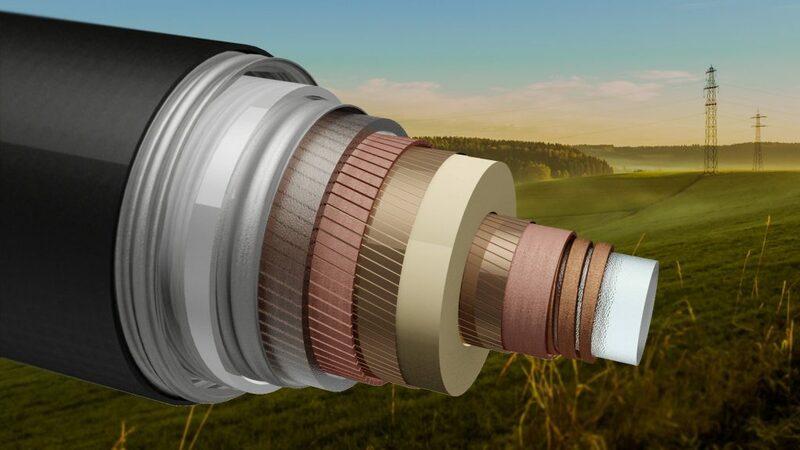 German legislation has defined the new connection as one of currently ten pilot projects to utilise three-phase underground cables in the maximum voltage range. TenneT will be laying out three-phase cables in its German control area for the first time, but has extensive know-how: In the Dutch Randstad region, the TSO has been operating such an underground cable section since 2013 ‒ the longest in Europe with a length of around 10km. In Haren, the initial preparatory work now has been concluded and the actual excavations are pending. Just the right time to bring the public further into the project. For that purpose, TenneT has opened an innovative and in-depth information centre on underground cabling in Dankern, just 100 metres from the cabling route. The centre is aimed at owners, residents and authorised users of the affected areas as well as at public institutions and interested parties. Visitors are also expected to come from other regions where TenneT wants to use three-phase cabling. Once again, TSCNET shareholder TenneT, the Dutch-German transmission system operator (TSO), is doing pioneering work for the transmission grid of the future: The TSO is planning to employ an innovative cable laying technology for the underground sections of the new 380kV Wahle-Mecklar line and thus has commissioned a specialist company with the development of a specified plough for laying extra-high voltage underground cables – up to now the experience with this laying technique is restricted to low voltage levels. The power line from Wahle in the German federal state of Lower Saxony to Mecklar in the state of Hesse is one of the national extra-high voltage projects, which are indispensable to succeed with the energy transition. Since the requirements for the precise laying of extra-high voltage cables are significantly higher than for lower voltage ranges, it is most important, whether these requirements can be met as safely and effectively as in conventional laying techniques. If the new method should prove resilient in the test, TenneT would be able to significantly reduce soil excavation, shorten the construction time of this and other underground projects, save costs and relieve the consumers. TenneT also has a keen interest in minimising any restrictions on farmers during the construction phase. That’s why the TSO committed to a comprehensive soil protection concept already before construction start. 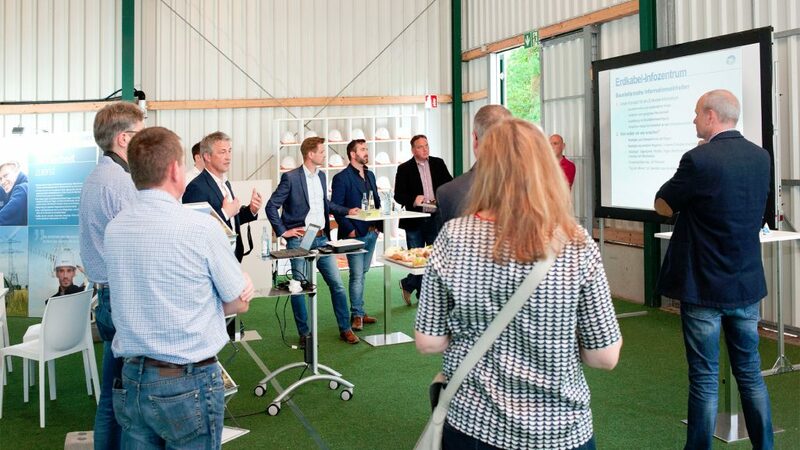 From 5 to 6 July, the Renewables Grid Initiative (RGI) held an international workshop on “The prospects of undergrounding power lines” in Raesfeld, in the northwestern part of the German federal state of North Rhine-Westphalia. The event was co-hosted by TSC member Amprion, one of the four German transmission system operators (TSOs). Amprion conducts a pilot project on underground cabling in Raesfeld. Therefore the participants had the valuable opportunity to visit not only Amprion’s exhibition about underground cables during the course of the workshop, but also the construction site of the on-going project, where they inspected the laid cable and the cable transfer station.